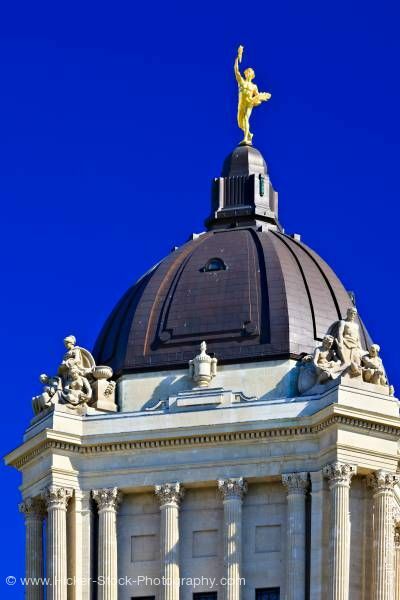 Stock photo of the Golden Boy statue crowning the dome atop the Manitoba Legislative Building against a clear and bright deep blue sky in the City of Winnipeg, Manitoba, Canada. The Golden Boy figure atop the dome of the Legislative Building in the City of Winnipeg, Manitoba, Canada. Each one of the four corners of the copper dome supporting the Golden Boy has a stonework grouping representing the four elements of alchemy, earth, air, fire and water. The dome is 223 feet 7 inches (68.1 m) above the main floor. The Golden Boy was sculpted by Georges Gardet and cast in bronze at the Barbidienne foundry in France in 1918. The true name of the Golden Boy is "Eternal Youth". Originally painted gold, "Eternal Youth" was gilded in 1951 in 23.5-karat gold leaf. He stands 17.2 feet (5.2 m) tall from toe to torch and weighs 1,650 kg (3,640 pounds). He carries a sheaf of golden grain in his left arm, while his right hand holds high a torch. The gold is a symbol of alchemy and those who searched for ways to turn lead into gold.